Spark joy in your projects by using Zenkit! If you’ve noticed that the people around you are suddenly obsessed with folding their shirts a certain way, or are thanking their items before discarding them, then they’ve probably caught on to the latest cultural craze: Marie Kondo and her life-changing magic of tidying up. While the importance of keeping things well kept and organized has been ingrained in us since an early age, what Kondo has done has acquainted the world with how much pleasure tidying up can bring. Her objective is to show you how to declutter your home so that it becomes a place of perpetual joy. In this article, we’ll take a look at what’s behind the magic of tidying up and how it can be applied to your digital presence. Marie Kondo is a Japanese organizing consultant, star of the Netflix series “Tidying Up with Marie Kondo”, and author of several self-help books, including the #1 New York Times bestseller, “The Life-Changing Magic of Tidying Up: The Japanese Art of Decluttering and Organizing”. Listed as one of Time’s “100 most influential people” in 2015, Kondo is renowned for her particular system of tidying up, decluttering, and organizing known as the KonMari Method™. Kondo’s technique of organizing advocates cutting down on excess and filling your home only with items that truly mean something to you. Described as a state of mind and a way of life, the KonMari Method™ encourages you to treasure possessions that “spark joy”. Although known to be a rigorous method, Kondo’s way of tidying up has amassed a host of fans and followers due to its emphasis on being “mindful, introspective, and optimistic”. She encourages you to find value in your belongings and to focus on the things you want to keep rather than the ones you want to throw away. As part of her philosophy, Kondo asks that you thank your items that no longer spark joy before getting rid of them. Doing so will reveal how the item contributed to your life, that you’re grateful for it, and are ready to say goodbye. A common cause for clutter is our inability to relinquish possessions due to the memory they hold. Following Kondo’s tidying up method enables you to reflect and acknowledge the significance your items had in your life, making it easier to let them go. Tidying up isn’t everyone’s favorite thing to do. Kondo’s concept of only holding onto the things that spark joy demonstrates a fresh approach to cleaning and organizing. It provides a guideline on how you should separate items by determining which still play an integral role in your everyday life and which are simply taking up space. Keeping your space well ordered and clutter-free is important for your performance and mental health. A study conducted by the Princeton University Neuroscience Institute found that the more clutter you have in your environment, the more it limits your ability to focus. It also highlighted how your ability to process information declines when in an untidy area due to the fact that the clutter competes for your attention. As mentioned in her book, Kondo explains how visible mess can “distract us” and that decluttering is a great solution to obtaining clarity and focus. 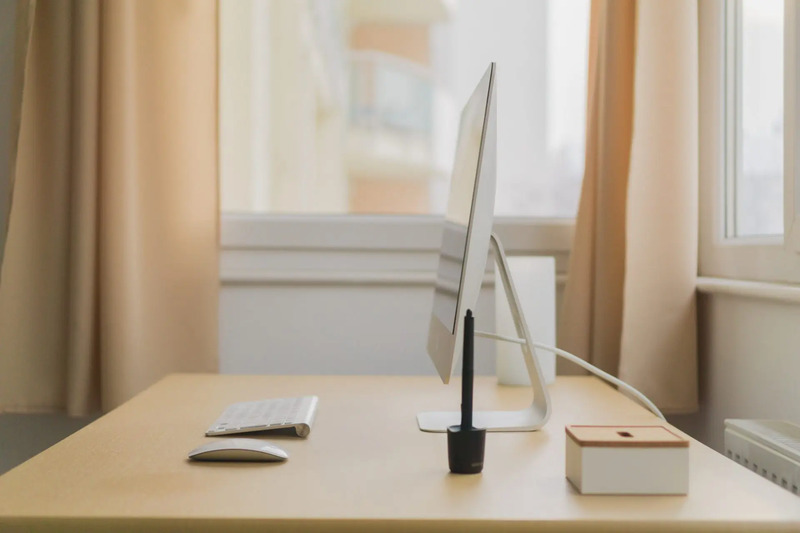 Just like a disorderly home or a messy office, an untidy digital presence can also have an impact on your everyday behavior and productivity. Think about it, is there anything worse than having to spend more time than necessary rummaging through your folders to find a particular image? Having your files organized for accessibility is just one benefit that a digital declutter can bring. It can also free up storage space, reduce your chances of receiving spam, and help strengthen privacy. Following the KonMari Method™ in its entirety may not be viable when it comes to your digital presence. However, there are still parts of the process that can be taken on. A great thing to adopt from KonMari is the concept of discarding things that no longer spark joy. Although the idea of what constitutes as “joy” may differ when it comes to work or school-related files, you have to shift your approach in order to make it feasible. For instance, while essay notes or sales reports won’t ignite the same kind of delight that photos from your holiday would, the fact that they contribute to your learning or commission salary still brings about a type of joy. If the joy isn’t to this level, is it truly joy? Part of KonMari asks you to visualize your perfect home before getting started. So, before getting started, visualize what your perfect inbox would look like and keep that thought throughout the task. Opening your inbox and being greeted with a barrage of emails is a definite joy dimmer. Nowadays, it’s a common requirement to sign up to a newsletter when registering for an online service and it can be easy to forget to unsubscribe to them which is why they’re piling up in your inbox. Now’s your time, unsubscribe to all the newsletters you don’t actually read. You can use an app like Unsubscriber to make the process easier. Once that’s done, you can get onto deleting spam and emails you no longer need. For the emails that are worth archiving, separate them from your inbox by creating a new folder to store them in. As well as smartphones, many of us own tablets, laptops, and other devices that alert us when we receive a message. It’s usually a notification for the latest app update, or a reminder for what we did seven years ago on this day, or constant pings from that high school group chat we’re still a part of for some reason. Most of the time, the alerts are trivial and do nothing but distract us from our work and daily to-do’s. So, if you want to maximize your productivity, it’s best to switch off the notifications that don’t require your immediate attention. Not all messages are worth the same value and it’s time to set them apart. Now’s the time to really employ the KonMari “spark joy” principle. When going through your files, truly ask yourself if they’re things that still resonate some sort of jubilation whether in your work, school, or personal life. (No, that photo of your ex does not spark joy). Once you’re done with your desktop, remember to do the same with the photos on your smartphone, tablet, iCloud, and any other digital platform where you have files stored. A point stressed in Kondo’s method is to ensure every item has its own special place as it makes it easy for you to locate things in the future. The same should be applied to your files. For files older than 12 months, pop them onto an external hard drive or a folder in your cloud-based storage. Chances are you aren’t likely to need them any time soon. However way you wish to categorize your them—whether by type or date modified—make sure they are organzed in a way that makes the most logical sense to you. But remember, you can only start tidying your files once you’ve let go of the ones that no longer trigger any type of happiness. Not only are unused apps a big drain on your battery, but they also take up storage space and can affect your device’s performance. If you can’t remember the last time you crushed a candy or exchanged a word with a friend then it’s probably time to remove the software from your smartphone, tablet, or computer. While it may be tricky to get rid of apps that were once so fervently enjoyed—especially ones that you paid for—don’t forget to envision your perfect device. Adhere to that. If having rows and rows of little colorful boxes is what brings you joy, keep it that way. The KonMari Method™ wants you to be happy with your environment. Since the introduction of browser tabs, going online has never been the same. Whether it’s to save a page we want to read for later or for ease of access to pages we frequent often, their convenience is unmatchable. There is a fine line, however, between having a reasonable amount of tabs to help you with your workload and disarray. Having numerous tabs open not only slows down your computer but it also feeds into the habit of multitasking, which we know, isn’t the best way to combat distraction. For optimized productivity, it’s recommended to restrict your tabs to a maximum of nine as every modern browser supports the Ctrl+ 1-9 shortcut to open a tab. Getting rid of social media may be a daunting prospect as they bring many of us a lot of joy. They’re great sources of information and our connection to the digital world. So, why the need to declutter? However much happiness these apps may spark, social media does have its detriments. The overload of information can get distracting and divert us away from things that need our attention such as work, school, or connecting with people in real life. Another issue is the ceaseless inclination of comparing yourself socially to your peers and the pressures that come with it. According to German researchers who studied people’s behavior with the social platform Facebook, one in three people were discovered to have experienced a negative feeling after visiting the site. Doing a cleanse—both with the apps you’re signed up to and the people within them that you follow—and minimizing your social media capacity will enable you to spend your time on things that are valuable and worthwhile, both online and offline. If you appear to be struggling with this one, a good way to think about it is to compare it to something physical, like your wardrobe. Sure, a lot of shoes are great to have but how many of them truly spark joy? How many pairs do you really wear regularly? Apply these points when tidying up your social media presence. Do you really need Instagram and Snapchat? How often do you actually communicate with people from high school? If your immediate reaction isn’t total elation, then it’s time to bid adieu. If you’ve been using Zenkit for some time—whether for personal or professional use—you may notice that you’ve accumulated your fair share of untouched items and/or collections. Going through your account and doing a purge every once in awhile is a great way to ensure you’ve got a clutter-free workspace. Think about your objectives for using Zenkit and keep envisioning this thought as you work through your collections. This will make is easier to determine which items should stay and which should be removed. Once you’ve deleted the necessary tasks or collections, it’s time to tidy things up. Switch views if you feel data would benefit more in another form. What was once a task list could be more effective as a Kanban board. Like many other productivity tools, Zenkit’s purpose is to facilitate productivity, however, it can only do so if you have the right system in place. By keeping your account organized to align with your goals you will have a much higher chance of accomplishing them. With the average adult spending 5.9 hours a day online, that’s a whole lotta of digital clutter that can be gathered. Doing a tidy up à la Marie Kondo will not only set you up with a more practical way of navigating your digital presence but will also make it a more joyous experience. Remember, the philosophy of KonMari is that we should cut down on excess and only hold on to things that we cherish and that truly mean something to us. I heard your ‘ignite delight’ tagline in an Old Navy radio ad this week (2/28/2019). Unlike you, Old Navy gave no recognition to Marie Kondo’s ‘Spark Joy’ inspiration. I think Old Navy should be paying her for that gag line instead of just riding the wave of her movements’ popularity without giving her credit.